This entry was posted in Commentary and tagged goldman sachs, TBTF. Bookmark the permalink. But, is really the “too big to fail that threatens to bring down the economy”, or is it what the “too big to fail” and all the other banks might be doing wrong? 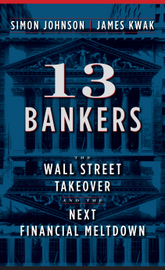 For instance make a list of all bank assets which have caused the recent crisis, and you will find they correlate totally with having been officially perceived as absolutely safe, and therefore allowed to be held against very little bank capital, and not remotely as much with having been held by “too big to fail” banks. Frankly, I think the “too big to fail” banks issue is becoming something of a dangerous distraction that takes away attention from the much more important issue of how different capital requirements based on perceived risks, really distorts the market and impedes banks from allocating resources efficiently in the real economy. The problem is that popular belief that a TBTF bank is TBTF and it actually being TBTF — that the government will bail it out — are intertwined. If people believe government will bail a financial institution out it’s hard for government not to. The US didn’t have to bail out Fannie Mae and Freddie Mac but no one ever doubted it would. The same turned out to be true for money market funds. Breaking out of this conundrum is a challenge. Goldman Sachs and Morgan Stanley were actually converted to bank holding companies so as to get access to the Fed discount window in March of 2008 when Bear Stearns became insolvent and. with Fed guarantees, was acquired by JP Morgan(becoming bigger). Michael Edesess says: “The problem is that popular belief that a TBTF bank is TBTF and it actually being TBTF — that the government will bail it out — are intertwined.” Precisely. That is what it means. So eliminate it by separating investment banking from deposit banking (even if it takes creating community banks to provide the old deposit bamks) and by regulating the shadow banking system by requiring them to be true free markets to eliminate the absurd level of asymmetry of information in these markets through measures to create transparency. This is not to ignore he effects of the differential advantage among the TBTF banks’ ability to lend (the basis point differential.) If investment banking institutions are all placed into the same market (separate from the deposit banks) and without access to the discount window or FIDC protections, TBTF institutions size could be limited also by requiring higher and higher reserve requirements the larger they become. Obviously, I am not a professional economist, but I think the professionals unnecessarily consider the problem complicated – it is not an economic problem, but rather, a political problem that has regulatory solutions that will not harm markets, but rather strengthen and stabilize markets. A case in point would be the problem of volatility in Wall Street markets due to program trading. The simple solution is to impose a nominal transaction fee (tax) on trades. Of course, this also is essentially a political problem. … now I read Kwak’s piece. Even a non-professional like me came to the conclusion that the nub of the problem is political. Time for simple majorities in Congress. The filibuster has outlived its usefulness. Let the chips fall where they may. I could not agree more that it is a political problem. But with that statement I also believe that it is a hopeless problem because Wall Street owns the political process both through its money and intellectual capture. But I think the problem is even more “simply” addressed by the American people making decisions that in effect shrink the big six to a point that they pose no systemic risk. It may be odd to think that galvanizing 300 million Americans is easier than getting their own elected representatives to do their will, but such is the role of incentives. Americans must choose one by one to bank and invest elsewhere and encourage through market forces what our political representatives will not do on our behalf. In the meantime, they hold us and our children hostage to a policy that promises to rob us once again of our future income in the form of taxes should any one of the six go down. I agree with your solution, Mike. It would be the ideal answer. It will not happen. Could CIT not have chosen to become a bank holding company when things got tough, thereby availing itself of Fed protection as did Goldman Sachs? I have been surprised that now that the crisis has passed Goldman has not reverted back to non-bank status in order to operate free of the presumable tougher regs that banks face. It suggests that the regs might not be all that tough. And/or the value of the window, yes? The simple solution is to put a nominal transaction fee on trades. The same turned out to be true for money market funds. This is not any kind of conspiracy but rather parallel messages expressed by people with convergent interests. This could be a good read. I must admit, it always seems simplest to add a tax, a fee, or a regulation. But there always seems to be unintended consequences and the fees, taxes, and regulations all add up to a tangled and expensive mess. Maybe there is an even simpler solution we are missing. I agree. It’s difficult to get regulation right, especially if it is too rigid. Complex model-based and ratings-based risk-weighted capital requirements and the resulting regulatory arbitrage played a significant role in bringing about the financial crisis. We don’t want that to happen again. This needs to be thought through carefully. Complex solutions should probably be avoided. Of course there is but then regulators would not be able to meddle, or to present themselves as sophisticated regulators. Ha! Yes, there is always an urge to “do something.” I admit to succumbing to it all the time. And with Regulators and Congress, it is more than an urge. It’s a regulator’s very role in life and Congress feels the need to “be seen” doing something. Everyone in the financial industry wants to believe they’re “sophisticated” — it’s the aura of the mathematical models that Taleb and Pablo Triana so rightly debunk (I’m a mathematician by the way). Somehow we need to make it generally known that it is not sophisticated — aeronautical engineers, among others, use much more complex mathematics routinely without being so impressed with themselves. And now Basel III continues this folly, even mandating the copula formula, which, though certainly not the worst of them, got such a bad name in the crisis. But I hasten to add that it is not the models themselves that are to blame, but the way they will inevitably be used. Never hurts to trim some fat from the books now does it? What a surprise. Mouthpieces for the den of vipers and thieves in the oligarchs whine and cry that they are mastersoftheuniverse doing godzwerk and that NOTHING should be done to counter their ruthless robbing, pillaging, and pummeling the poor and middleclass for the otherworldly profits of the predatorclass. We see today the predatorclass reaction to the hint that the Fed will someday reduce the printing of trillions of dollars out of the myst and funneling into the offshore accounts of the predatorclass den of vipers and thieves in finance oligarchs. The socalled freemarkets are unhinged from, and untethered to any form of fundamental economics, basic math, and any semblance of ethics, morality, or that thing we once called justice – and instead are TOTALLY dependent (like crack addicts) to the neverending stream of the various central banks (most notably the creature from Jekyl Island) bond purchases, and ZIRP policies providing unlimited crack, I mean printing money out of the myst and funneling it into the offshore accounts of the predatorclass den of vipers in the finance oligarchs. A day of reckoning will come and there will be blood!!! The predatorclass imagines they can rob, pillage, spy on, incarcerate, pummel, and in sundry ways abuse the rest of society, the 99% without consequences. Apparently – these mastersoftheuniverse do NOT have any appreciation or understanding of human history. Because throughout history – whenever tyrants, oligarchs, fascists, and ruthless, criminal, predatorclass bloodsuckers become drunk with greed, obdurance, power – the end is always violent revolt and often predatorclass bloodsucker heads on pikes!!! A pox on the house of Goldman Sachs and the entire den of vipers and thieves in finance oligarchs. Burn it all down. Reset! It’s the only option!!! Too big to fail is the most disgusting example of a scapegoat in financial history. The plane was going down and the banks got a golden parachute. What did we get…. we got an anvil. Simon, what really bugs me about the Goldman set (all the TBTFs) is the low cost of borrowing at the FED discount window and the distortions this creates in the broader investment market. Under the QE FED regime, the largest banks have bolstered their assets to an aburd degree. They can’t lend the QE monies, but, when added to their asset base, these funds create a major imbalance against all other potential investors, and enable a dangerous degree of market control. I say dangerous because these same banks are now highly involved in new derivative bubble building and that could easily prove to be the undoing of any of the meager prosperity which is seeming to vanish as we speak, that is globally. What happens now, when some disruptive market event creates chaos and a substantial portion of the newly minted derivatives start to rot (like in 2008), and these banks get into more trouble. The derivative markets are now well in excess of a quadrillion dollars of national value, and listed as assets and backed by CDS’s (as before). This house of cards would collapse with far more impact than the last time, given the overall weakness of the international economy. Then TBTF would come home to roost in spade. The level of instablility created globally would surely have a huge impact on nations simply trying to survive, and thus the impact would be far more political than financial, although the financial part would be catastrophic. And yet, our regulatory schema keeps inviting these things to become perpetually perilous. Besides, there is no such thing as enough carbs, she said. you to develop the right attitude for reducing your weight. issues surrounding farming, dining and the food industry. by spiking your blood sugar at a regular level. find a new way to your mind. Research has proven a nutritious morning meal assists in removing weight.